I haven't had my coffee yet." You've probably heard that cautionary phrase before, or even spoken it yourself. It acts as both an apology for grumpy behavior and a warning to its listener, roughly translating to "my day has not officially begun." For many of us, that warning holds true; the day doesn't truly start until we've had our first energizing sip. But if we're buying a cup from a cafe everyday, our habit can quickly turn costly — one $3 cup per day adds up to more than $1,000 per year. So, where does that leave us frugal coffee connoisseurs? How can we recreate the cafe experience at home? To answer that question, I asked some local java experts how to make quality, cost-conscious coffee in our own humble abodes. As it turns out, making a tasty cup doesn't have to be time-consuming — and it doesn't require $450 worth of equipment, either. The experts I spoke with all agreed that the quality of beans determines the quality of coffee. According to them, it's the one area where corners shouldn't be cut for cost's sake. Although most of the experts disagreed when it came time to recommend a specific brand (not surprisingly, most supported their own), they were in agreement on one simple concept: Don't go for the brand names. "I stay away from the big brands," said Alan Barbaran, a barista at World Ground Cafe (308 Jackson St., Oakland). "The household names — they just aren't as good. They're cheaper, but not better." Barbaran attributes the lower quality to factory methods of production. He said it can take weeks for brand-name ground coffee to hit the shelves at your local supermarket, so by the time you take the tub or package home, a lot of the flavor has already been lost. And while buying coffee from a cafe might be a lot pricier than a huge vat of Folgers, the additional money spent supports local businesses, many of which ethically source their ingredients as often as possible, Barbaran noted. Taste, Fall 2015: At-Home Coffee Brewing from Bert Johnson on Vimeo. Kaleb Houston, director of Red Bay Coffee (45 Grand Ave., Oakland), echoes Barbaran's advice. He said a lot of the big brands use a bean called Robusta, which has a poor taste compared to the cafe-preferred Arabica bean. "Robusta coffees are kind of like a super cheap, super-species engineered to be highly disease resilient, yield more beans per harvest at lower altitudes, and contain up to three times the amount of caffeine," he said. "But there is a downfall: They are rather low quality beans." Though Arabica beans are more expensive, Houston said that purchasing them is also an ethically sound choice. "[Buying Arabica] creates higher incomes for the farmers, which allows them to create better processes, build better schools, pave more roads, and live better lives," he said. "For us, [good coffee] will always be a balance of quality, ethics, and sustainability." 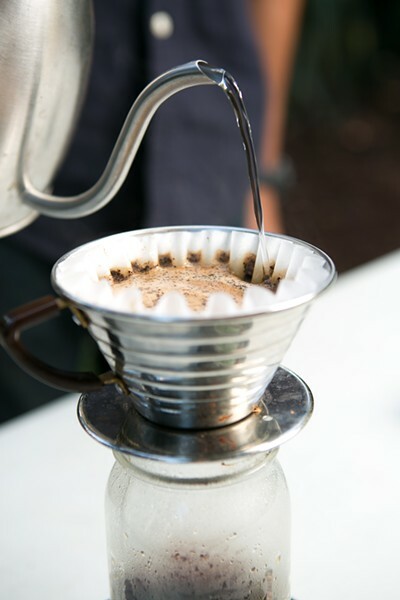 The pourover method extracts the full flavor of coffee. For coffee drinkers who prefer to buy beans that have already been roasted and ground, options abound in the East Bay. Places such as Artis (1717 4th Street, Berkeley, ArtisCoffee.com) roast, grind, and ship coffee the same day, while also offering delivery and discounts with subscription packages ($9.95–$22.95 per pound without subscription). And if Artis isn't your style, other options include buying beans from a favorite cafe and asking a barista to roast or grind the beans at the shop. Or, you can listen to an expert: Houston said he prefers Chromatic (ChromaticCoffee.com), Insight (InsightCoffee.com), Verve (VerveCoffeeRoasters.com), and Red Bay (RedBayCoffee.com) brands for quality and taste. If you still can't decide, Sweet Maria's (SweetMarias.com) is a valuable resource for coffee connoisseurs and novices alike. The online site is a vault of information for people who need help selecting a blend or roasting method right for them. Though Sweet Maria's specializes in "green" coffee — meaning coffee that has not yet been roasted — it also offers options for roast coffee. But, if you go this route, you'll still need a decent grinder. For cost-conscious coffee drinkers, Houston recommends the Hario Skerton ceramic hand grinder ($28), which he says is a decent alternative to the Baratza Encoure ($130) that he uses at home. Whatever coffee beans you ultimately decide to buy, keeping them fresh is also crucial for coffee-drinkers hoping to re-create the cafe experience at home. Mason jars may be trendy and have aesthetic appeal, but the best storage for coffee is in something completely airtight. At home, Houston stores his coffee in rolled plastic bags to prolong freshness. If you really want cafe-caliber coffee, you're going to have to put the Keurig back in the cupboard. "[Bad coffee comes from] anything with a plug," said James Freeman, founder and CEO of Blue Bottle Coffee Company (4270 Broadway, Oakland), with a laugh. Many baristas recommend using the pourover brewing method, which can easily be used at home. 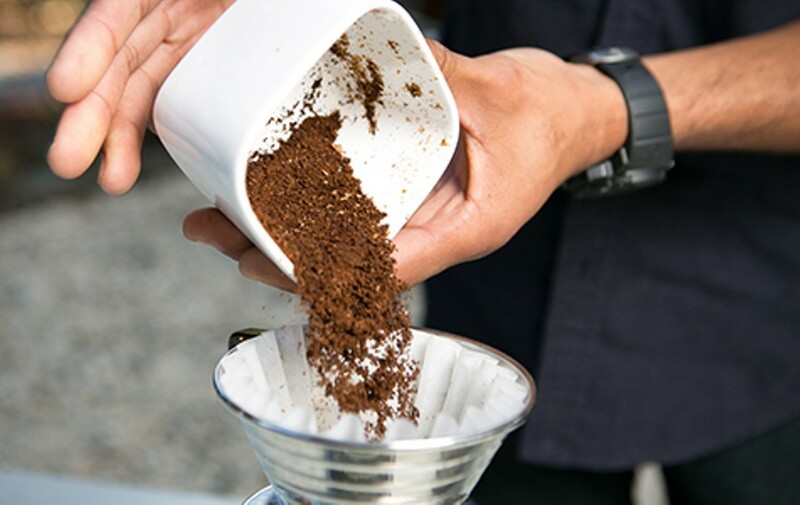 The technique involves using a cone-shaped coffee dripper to pour water through coffee grounds and extract full flavor into the coffee cup. It only takes about three and a half minutes to make, and the equipment is actually cheaper than most run-of-the-mill coffee machines. All you really need is your mug of choice, some coffee filters, and the cone-shaped dripper. Houston uses the Kalita Wave Dripper 185 ($25), which has a sleek design that doesn't allow the water to disrupt the bed of coffee in the filter. Freeman recommends the Bonmac porcelain dripper ($20), which is an ideal cone for beginners due to a design that automatically meters the water flow. "It's an incredibly pure and undemanding way of looking at coffee," Freeman said about the pourover method. For more information on how to use cone drippers, visit Sweet Maria's online site. If this all seems difficult, fret not. Creating easily repeatable, tasty coffee at home takes practice. "We take people that are nice and interested [to work at the store], and six months later, they can be great, amazing baristas simply because they care," said Freeman. "It's a craft, you get better at it every single day. It's not like learning the cello or anything."